Noted writer Anand Rajan catches the building's garbage collector, Khalil, searching frantically through his dustbin. Suffering from a writer's block, he becomes curious about Khalil and starts spying upon him. This leads to the revelation of some very interesting things about the man and in order to delve deep into his life Rajan invites him over to his house for a session of weed. The lonely writer very soon finds a friend in this unusual company and starts warming up to him. They both start sharing queer incidents from their lives with each other. 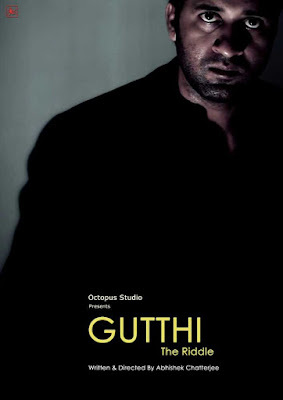 Gutthi (The Riddle) is a story about this night-long conversation they have and how this leads to unlocking of several mysteries in their lives.